Today, 31 years ago, I celebrated my fourteenth birthday. And I did it in style, since one of the gifts I received from my parents was the then newly released soundtrack double LP album This Is Elvis. I remember my class visited a swimming stadium that day, and all I could think of was getting home to listen to my new Elvis album. I must have spent the whole evening playing those two records over and over, and looking at all the small photos from the movie printed inside the gatefold. Some of the songs I recognized, but a lot of them were new to me. Like “That's All Right,” that both me and my brother thought sounded a bit funny back then. Digging out my copy of the soundtrack today, I couldn't help notice how worn the cover was, and how scratchy the two LP's looked. I must have played them many, many times through the years, although it has been a while now. Therefore I decided to give this faithful old servant yet another spin, and it was nice to get reacquainted with it. I've always liked the tracks on the album and the order they are placed in. For example, I find the inclusion of “Army Swearing In” (that ends with the words “Private Presley, you'll be in charge of the group”) followed by “G.I. Blues” to be highly effective. Another example of this is the “Excerpt From JCs Award To Elvis” that segues into “Promised Land” (containing Elvis' harmony vocal overdub). Also, it hit me how much of the material was unreleased at the time of the album's release. Like the four great TV appearances from 1956 and 1957, one of them Elvis' performance of “Hound Dog” from the Milton Berle Show, that caused an uproar in the press the very next day. Then there's the fantastic sounding version of “An American Trilogy” from the April 9, 1972 show in Hampton. Another highlight is the overdubbed version of “Always On My Mind,” from the mock session Elvis held for the Elvis on Tour movie. Actually, these two tracks have yet to see an official release on CD. When I first heard this soundtrack in 1981, “Blue Suede Shoes” from the 1968 TV Special quickly became a favorite. It took years before I learned that this track was a spliced version from the June 27, 6 PM sit-down show and the June 29, 6 PM stand-up show. At the time I didn't know that “Merry Christmas Baby,” “Too Much Monkey Business,” “I Got A Thing About You Baby” and “Promised Land” were edited as well. Now, 31 years later, I have a far better grasp of the Elvis Presley catalog. 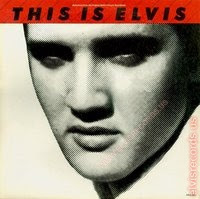 But This Is Elvis was one of those albums that pointed me in the right direction, and it remains special. Hopefully, it will be available on the FTD label someday. Ernst Jorgensen, it would make for a great birthday gift! Great post about a forgotten gem of an album. I still kick myself for not picking up the vinyl version of this when I was growing up. I don't recall, but I think it was probably due to the cost. I eventually bought it on cassette tape, but that's just not the same as a vinyl or CD for me. 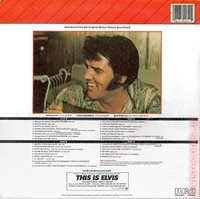 Though it is true that, as far as I know, the overdubbed rehearsal version of "Always On My Mind," has never seen an official CD release (though it appears without overdubs on The Great Performances and Elvis On Tour: The Rehearsals), the Hampton Roads "American Trilogy" with overdubs has had some official CD releases. I have it on the Patriot CD. I've ordered an inexpensive, used copy of The All Time Greatest Hits to find out if the sound quality exceeds that of Patriot. Hi Troy, and thank you for setting the record straight. I actually have a copy of The All Time Greatest Hits, and immediately listened to "American Trilogy," and true enough, it was the overdubbed version from Hampton Roads. The sound quality is excellent, as far as I can tell, with just some slight hissing that can be heard at the beginning of the song. What an incredibly version, and the overdubs really work well on this one. Though I'm not an American, listening to Elvis singing it sent shivers up my spine. That speaks a lot of his performance, don't you think?! That one is definitely my all-time favorite rendition of "An American Trilogy," as I mentioned in a post last year. I can't imagine a better version ever coming along.